This was another enormous twenty-person meet, with the club taking all eighteen dorm beds and another two members independently booking a room, in the spacious and comfortable By The Way hostel. Despite the MWIS promise of perfect weather, an inversion and a 90% chance of cloud free munros, Saturday's dawn revealed the usual scottish clag sitting low on the hills while exposing enough vertically to dash any hopes that it might be something which could be ascended above. Of course this didn't discourage anyone and intrepid EMC members headed off early in all directions in search of some winter action. At least it stayed fairly dry and windless! 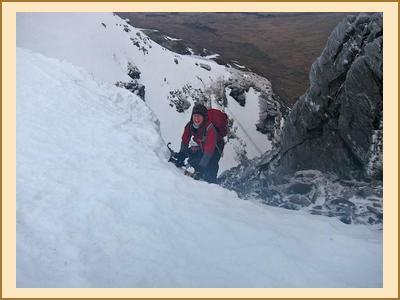 Mike, Fiona and Tim opted for Central Gully on Ben Lui which was ascended without difficulty. Finding the normal route down in the fog proved more of a challenge. Following easier going on snow-slopes led them too far west and they ended up following the Allt an Rund round to the usual crossing point, but were still first back to the hostel. Chris, Fiona and Allison went searching for some proper winter climbing in high Coire Chat on Ben Cruachan and climbed several routes including Noe Gully and Quickfire. 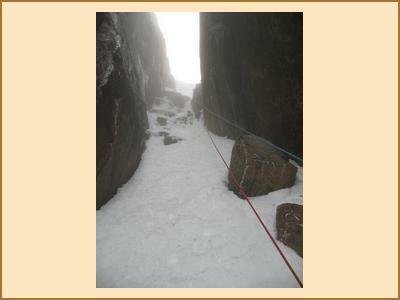 Of the remainder, the majority opted for a big day out and a traverse of the Black Mount. With the icy conditions demanding crampons but it being insufficiently snowy to avoid much teetering around on the rocks, and the poor visibility all day, it's no surprise that they didn't return to the hostel until well after seven. Sunday saw the promised good weather finally arrive (although still inversionless). An enormous mob headed in from Achallader farm for a pleasant ascent of west gully on Beinn an Dothaidh (and Claire's grade-one-gully induction). No-one was minded to continue much further as the cloud returned, and the party retreated down the west ridge to Real Foods. Alan, Anne, Kenny and Alison had a quick ascent of Meall nan Tarmachan but didn't fancy the ridge in worsening conditions. Chris and Fiona had to drive a long way to find a Corbett neither of them had done yet. One member who shall remain nameless shamed the club by visiting Stirling castle instead.